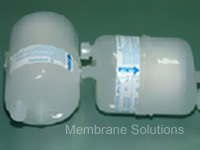 Cap-Pure Nylon is suggested to filter aqueous solutions. It combine a glass microfiber prefilter and a nylon membrane, improving flow rates and prolonging the life of filter. It can be used for filtration of heavily loaded and aqueous solutions including virus suspensions, biological suspensions, enzymes and buffers.